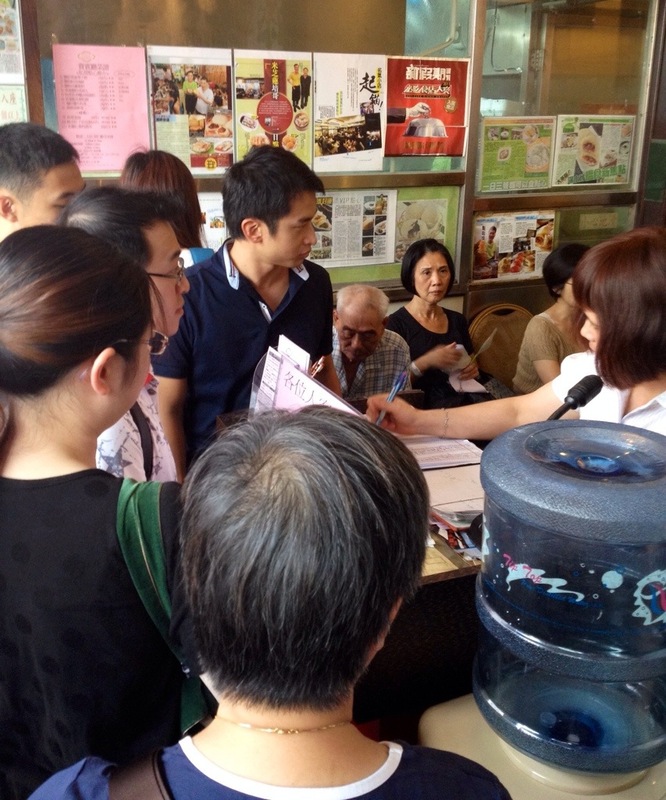 Tim Ho Wan–Taken after the lunch rush. Ask an Asian cuisine foodie about dim sum and you’ll most likely see their eyes roll back in their head while they fire off a series of odd sounding food descriptions, making it seem as if dim sum is the best food on the planet that you should never try. Google “dim sum in Hong Kong” you’re likely to find more information than you care to sift through on where to find the “best” and “most authentic” dim sum in arguably one of the best culinary countries in the world. 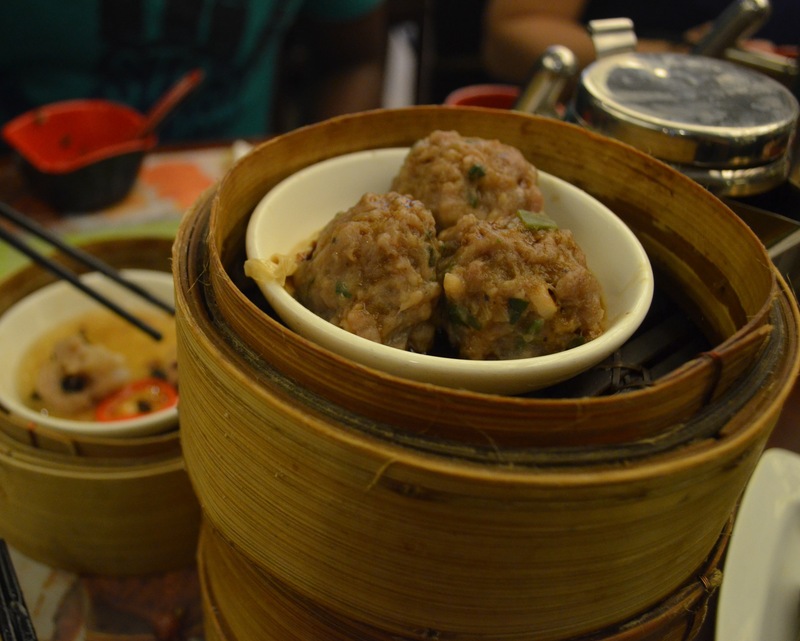 Enjoying a quality dim sum meal was certainly high on the to-do list when I visited Hong Kong for the first time last month, but not enough to sift through thousands of google hits and restaurant reviews to find the “best” one. 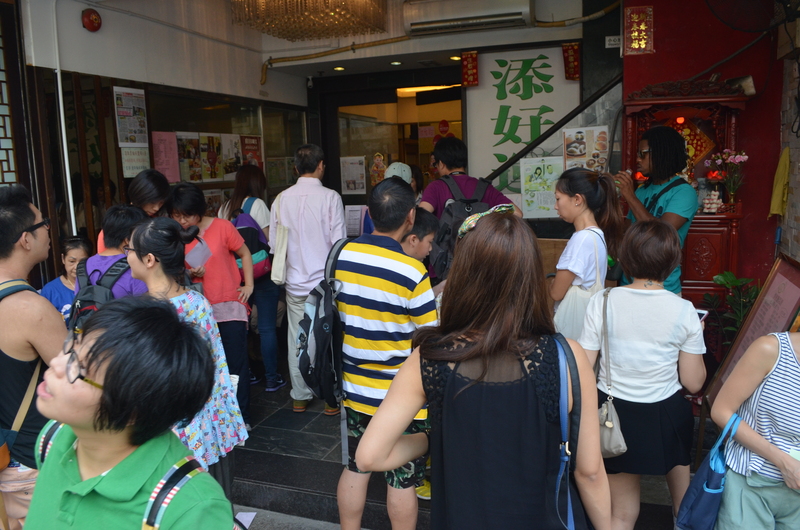 When the time comes to choose restaurant, I pick the closest place to our Airbnb room in Mong Kok: Tim Ho Wan. It’s earned a Michelin star and has received praise from food bloggers all over the interweb so I’m confident it won’t be a blank mission. The restaurant is easy to find. We hop off the subway and stroll through a small street market and quiet neighborhood to get there. It doesn’t look like much; sporting a boring green and white sign over a humble entryway with a few plastic stools. If it wasn’t for the group of 20 or so people waiting outside and the host shouting out numbers over a microphone, we might’ve walked right past it. We give the host our name and snag an all-Chinese menu. I stare at it for a moment pretending to understand what I’m looking at before trying to sneak a peek at the people around me to see what they are ordering (a method I employ often but seldom have success with). When this fails I resort to comparing the Chinese characters on the menu to those on a few photos of a newspaper article the restaurant staff has hung in the entryway. None of this matters because 20 minutes later we’re seated inside and given two menus printed in perfect English. As expected, the restaurant is packed tight and what little space is provided for walking is dominated by servers shouldering large trays of food stuff. As with the outside, the interior is nothing special–a simple black and white decor with little to no wall decorations and a glass case holding various awards. The cacophony of clanging tea kettles and plastic chopsticks might piss me off anywhere else, but here it’s shrugged off a necessary component of a popular restaurant. Also, I’m too hungry to care. We’re seated next to a woman and her tween daughter who’s shoulder deep into her smartphone. 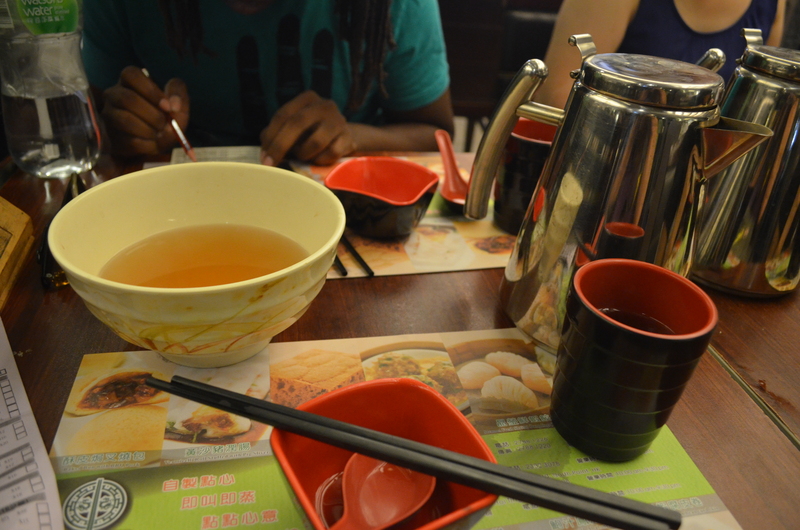 Mom kindly instructs us to rinse our cups, chopsticks and bowls with hot tea before using them. Her daughter looks up for moment to survey our work, then returns to Candy Crush Saga. We’re then told (through hang gestures and thumb ups) that we should order the baked pork buns. Rinse your dishes in tea and you’re good to go. We tick seven different dishes on the menu (including the baked buns) knowing it would be too much but wanting to sample as much as possible. The top favorites include steamed shrimp and pork dumplings (shu mai), steamed beef balls wrapped in bean curd and the steamed vermicelli rolls stuffed with beef (the version with BBQ pork seems to be more popular, however. Beef balls wrapped in bean curd. The steamed spare ribs in black bean sauce and “Chiu Chow Style” dumplings were middle-of-the pack favorites but more than warranted a spot on our tiny table–save the slippery nature of the spare ribs which nearly caused me to shoot one into the lap of the woman sitting next to me. I probably would have enjoyed the glutinous rice dumplings more if I wasn’t already stuffed by the time they came out, but I still had enough room to polish off some of the grilled pork inside. The baked pork buns (char siu bao) recommendation holds up because it’s perhaps the best item on the menu; flakey and slightly sweet on the outside, soft and gooey on the inside, oozing with tender pork and a BBQ sauce that is nothing like you’d expect to find in this part of the world. I was tempted to grab six for the road. 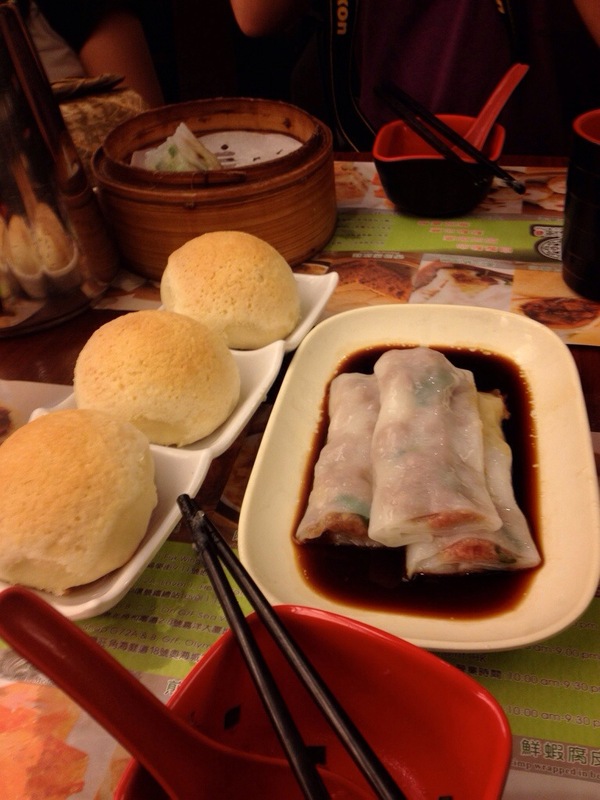 Baked pork buns, vermicelli rolls stuffed with beef and a single “Chieu Chow” style dumpling. By the time we are finished the restaurant has cleared out a little and we thank the the woman and her daughter for their recommendation. The entire bill runs us 129 Hong Kong dollars (about $17 USD). Michelin quality food for less than twenty bucks. Take the Tsuen Wan (red) subway line north to Sham Sui Po. Walk straight out of exit B2 and you’ll be on Pei Ho St. Walk through the market and take a right on Fuk Wing. It’s four blocks down on the right, just before Fuk Wing meets Tai Po. 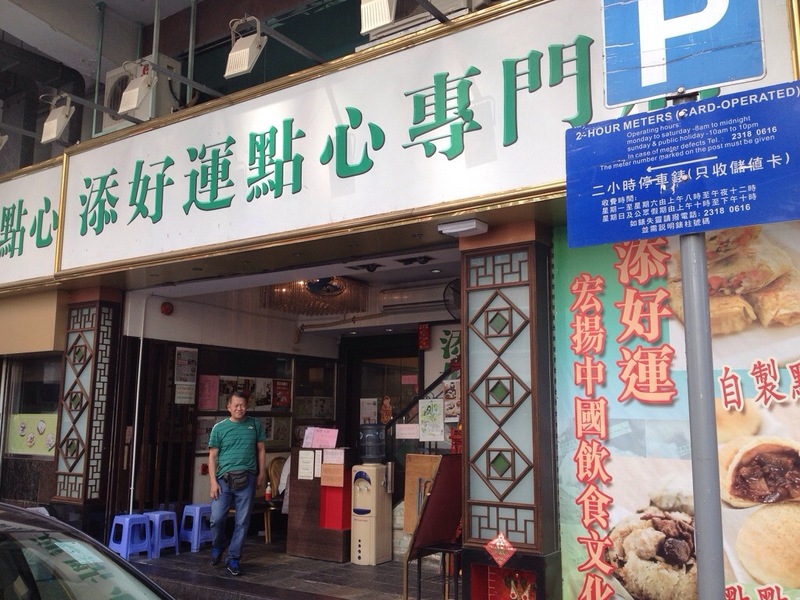 This entry was posted in Food, Travel and tagged Dim sum, Food, Hong Kong, Kowloon, Mong Kok, restaurants, Sham Shui Po, Tim Ho Wan by Jay Woodson. Bookmark the permalink. Good account of eating in Hong Kong. I went to so many places when I was there but never got the names of any. It really changed my idea of what Dim Sum is all about. Thanks for the read. Yeah, I think Hong Kong lends itself to taking on a whirlwind of food without remembering what or where. There’s almost too many options. You’re welcome. The food was not only delicious, but also cheap!